What was the Star of Bethlehem, a.k.a. the Christmas Star? “What cosmic light could have guided the Three Wise Men to the newborn baby Jesus 2,000 years ago? Learn about all the theories in a free webcast today (Dec. 23) by the online Slooh Community Observatory. https://3ap.org/wp-content/uploads/2018/08/logo_web_2018-300x300.jpg 0 0 DeSantisK https://3ap.org/wp-content/uploads/2018/08/logo_web_2018-300x300.jpg DeSantisK2016-12-23 20:18:472017-02-09 10:04:36What was the Star of Bethlehem, a.k.a. the Christmas Star? This year the Geminid Meteor Shower, traditiononally arguably (Perseid Meteor Shower) the best meteor shower of the year, is expected to peak on the night of December 13 into the morning hours of December 14, accompanied by the December Full Moon. In Pittsburgh the Moon is Full, December 13 at 7:05 PM EST with Moonrise at 5:06 PM EST that evening. This year’s mating of the Full Moon with the peak of the meteor shower is disadvantageous for optimal meteor viewing with the bright moonlight expected to wash out all but the brightest meteors. 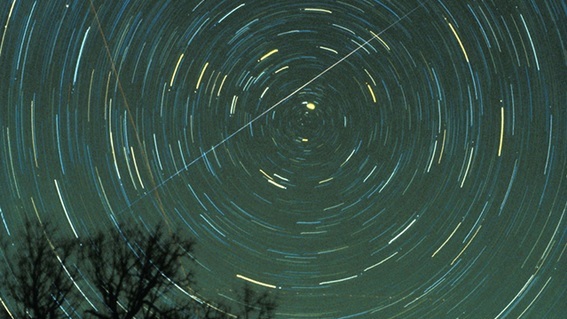 How far do you have to travel to see the stars clearly? Join lecturer, author, and astronomer Diane Turnshek as she discusses how light pollution not only prevents us from living under a sky bright with stars, but also negatively impacts human health and the environment. Turnshek will examine how innovative science and technology can reverse this steady creep of sky glow, allowing us to view the same star-filled sky that all past generations did. Time: Doors open at 6 pm, and the program is 7-9 pm. Diane Turnshek is a lecturer in the Department of Physics at Carnegie Mellon University and the Department of Physics and Astronomy at the University of Pittsburgh and is a member of the AAAP. She has published hard science fiction with a focus on space colonization and first contact. Her love of both astronomy and science fiction led her to crew the Mars Desert Research Station near Bryce Canyon, Utah in 2012, where she turned her attention to dark sky advocacy. Her fight against light pollution has taken many forms, including giving a TEDxPittsburgh talk. Turnshek is also a 2015 Dark Sky Defender award recipient, recognized by the International Dark-Sky Association for her contribution to light pollution mitigation. September 9 – Space Electronics and Robotics, John Branthoover, Senior Engineer, Astrobotic Technology. ~ Science Stage, Carnegie Science Center. October 14 – New Horizons: The Adventure to Pluto, Mark “Indy” Kochte – NASA New Horizons Mission Specialist, John Hopkins University Applied Physics Laboratory. OmniMax Theater, Carnegie Science Center. November 11 – Astrophotography Contest, Allegheny Observatory. January 13 – Well, Now What? What to Do Once You’ve Found Another Earth, Thomas Beatty, PhD, Post-doctoral Fellow, Pennsylvania State University Department of Astronomy and Astrophysics Center for Exoplanets and Habitable Worlds, Science Stage, Carnegie Science Center. February 10 – Annual Planetarium Show, Buhl Planetarium Theater, Carnegie Science Center. March 10 – High-Energy Astrophysics: the fascinating world of supernova explosions and pulsars, Harsha Blumer, PhD, Post-doctoral Researcher, West Virginia University, Morgantown, WVA and Greenbank Observatory, Science Stage , Carnegie Science Center. April 7* – Hunting for powerful monsters: supermassive black holes in distant galaxies, Chien-Ting Chen, PhD, Astrophysicist, Pennsylvania State University, Buhl Planetarium Theater, Carnegie Science Center. May 12**- Speaker and topic to be disclosed, Science Stage. AAAP meets 7:30 PM, 2nd Friday of the month at the Carnegie Science Center, Science Stage unless otherwise noted. Meetings open with the speaker followed by an intermission before the business meeting. 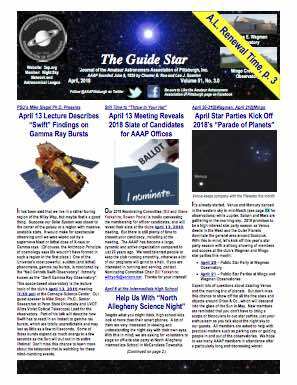 The November meeting is to be held at the Allegheny Observatory and the April meeting is scheduled to April 7 from April 14ˊand will be held in the Planetarium. For updates, please see the AAAP website www.3ap.org, AAAP Guide Star Newsletter, and Facebook Page . *Nomination of Officers at April Business Meeting. **Election of Officers at May Business Meeting. Download a pdf of the 2016-2017 AAAP Meeting Schedule here aaap meeting speakers 2016-2017.